James Kraig Kahler, sentenced to death for killing four members of his family, is escorted from the Osage County Courthouse following Tuesday’s sentencing hearing. LYNDON—Almost two years after killing his wife, two daughters and his wife’s grandmother, James Kraig Kahler has been sentenced to death by an Osage County judge. Tuesday morning, Osage County Chief Judge Phillip Fromme affirmed a jury’s Aug. 29 verdict of the death sentence. Following a two-week trial in August, the jury convicted Kahler, 48, of killing his wife, Karen Kahler, 44, his daughters, Emily, 18, and Lauren, 16; and Karen’s grandmother, Dorothy Wight, 89, in Wight’s Burlingame home on Nov. 28, 2009. In addition to capital murder, Kahler was convicted of four counts of first-degree murder and one count of aggravated burglary. During Tuesday’s sentencing hearing, Fromme said it was his duty to determine whether the jury’s recommended death sentence was supported by the evidence presented. Amy Hanley, assistant attorney general, listed evidence supporting the aggravating circumstances that resulted in the sentence. Hanley noted Kahler’s son, Sean, had witnessed his father shoot his mother after Kahler had burst into Wight’s home; the victims had the knowledge they were going to be shot as shown by a Life Alert recording of the shootings; and Lauren Kahler had been chased up a flight of stairs by her father before being mortally wounded. “[The victims] would have been able to see and hear what was going on around them as they were dying,” Hanley said. 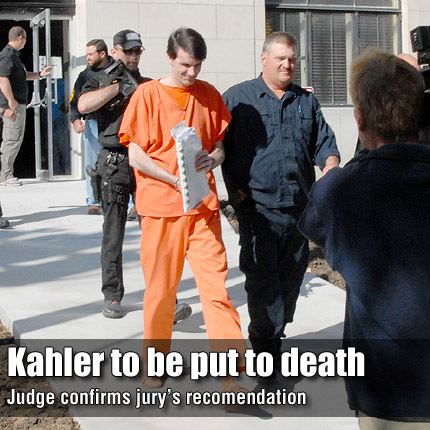 One of Kahler’s attorneys, Thomas Haney, noted no Kansas judge has overruled a jury verdict of the death penalty since Kansas had reinstated it as a possible punishment. Haney urged Fromme to consider overruling the verdict due to the Kansas capital murder law, which defines aggravators as committing a murder that is heinous, atrocious or cruel; and as killing multiple victims.